Dove Men + Care Thick & Strong Fortifying 2-in-1 Shampoo and Conditioner is specially formulated to make hair visibly thicker* and stronger**. 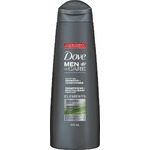 This fortifying 2-in-1 shampoo for men is designed to offer hair care for men with fine or thinning hair, combining cleansing with moisture. The formula with caffeine and calcium, washes away dirt and grease while making both fine and thinning hair stronger and more resilient**. 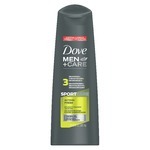 Dove Men + Care Thick and Strong is a great shampoo and conditioner combination. I noticed a definite plumping to my hair. I like that it is 2 products in one. Great time saver. 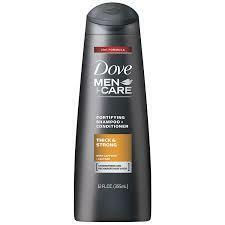 This is my favorite shampoo/conditioner. 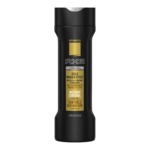 It leaves my hair soft and clean feeling with a great fresh scent. Doesn't cause any itching of the scalp or dryness. Love the smell of this shampoo, and it seems to work well too. The price is a little high, but it frequently goes on sale. We definitely stock up on this in our house. Hubby has thinning hair, and as I get older my fine hair seems to be thinning out as well. We decided to give this shampoo a try. While I wouldn't necessarily claim it to thicken your hair, I will say it made our hair feel and smell wonderful. It added a bit of fullness and volume but did not thicken our hair. Washes out well and only a dab is needed. 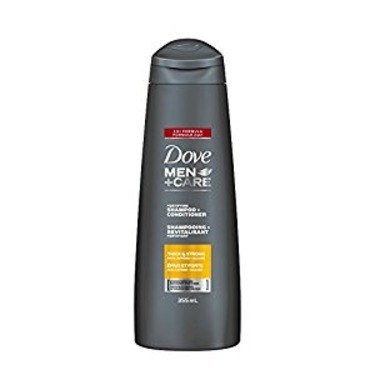 Even though we have a few different shampoos/conditioners on the shelf if this bottle is empty my husband is requesting another bottle as it has become his GoTo combo shampoo/conditioner. Having one product to wash and condition saves be time but having one that works this well and smells great is an added bonus. Thank you Dove for hitting the nail 8n tge head with this one! I had a really bas Time choosing the rigth shampoo and conditionner for my hair.But once i found dove men it totally change it all.That was the bestvthing i did to fit with my type of haïr. Feeling was just amazing .No more dryness and itchyness .I felt so relieved i trully recommend it to people with fussy haïr it really does magic even my family found the results amazing.I will definetly buy it on futur and for the rest of life! I was asked months ago to buy a different shampoo for my son. I came home with this Dove product and when I asked my son afterwards; he really like it and it turns out my other son had used it also. So this product was a hit here! I will continue to purchase this for them. I try to get it on sale often because sometimes depending where it's not always super affordable. These reviews are the subjective opinions of XY Stuff members and not of ChickAdvisor Inc.